When it comes to rubs and seasoning for Cedar planked salmon, you can get as creative or as simple as you like. Sometimes less is more and this applies to the delicate nature of fish like salmon. Both coarse salt and pepper work best for this, and the brown sugar adds an earthy sweetness that also helps the salmon develop a nice caramelized hue. 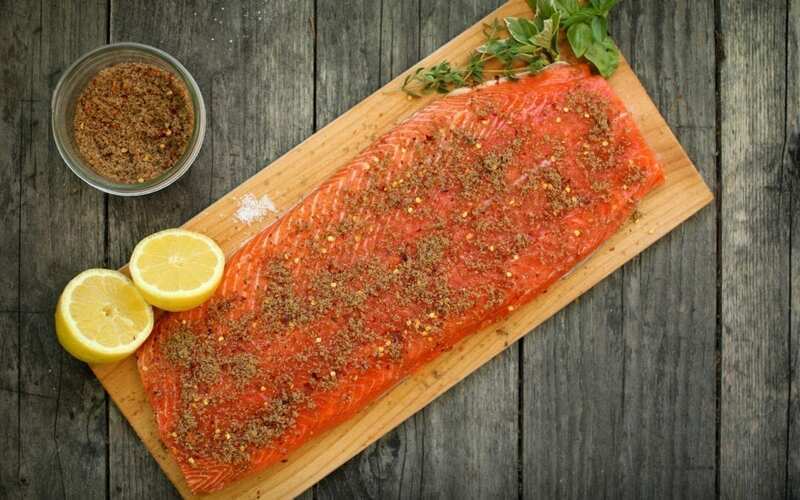 Our tried and true Cedar Planked Salmon Fillet with Brown Sugar recipe is worth checking out. The classic store-bought, lemon pepper seasoning works great with the flavors of Cedar and salmon. If you are feeling intrepid, grate some fresh lemon zest and combine it with equal parts coarse ground pepper and kosher salt to step it up a few notches. This blend is fantastic for an Asian twist that won’t interfere with the star, and complements Cedar well. This rub may sound simple, but the flavors it contributes are complex and extremely delicious. Smoked, or Spanish paprika, is potent, and when used sparingly adds a balanced hint of smoke. Smoked salt can be purchased but is more affordable if produced yourself. It can be made in all varieties of smoker by simply being placed in a shallow pan and stirred occasionally over several hours. I recommend using a very flaky salt, the larger surface area provides more for the smoke flavors to bind to. All of these rubs are comprised of ingredients that most households will have stocked in their pantries or spice shelves. However, before you start, I recommend that you take stock and check labels. Just like fresh, dry herbs and spices don’t last forever and expired product can be easily missed in the dark recesses of your designated cupboard. All herbs and spices should come with an expiration date but the general rule of shelf life, is as follows. Expired herbs and spices don’t necessarily become inedible with age, but overtime they gradually lose their potency and if they are exposed to light or warmer temperatures, changes in color will also occur. Always store herbs and spices in a cool, dark place in airtight containers. Quality of ingredients is the foundation of everything you cook. Before you start cooking, always take the time to ensure your spices are as delicious as they were originally intended to be, and never be afraid to try something new. You never know what tasty discovery you may find.